KINGSPORT — Whether the community rebuild of The Castle Playground at Johnson Elementary School is finished as planned Sunday afternoon for an informal 5 p.m. public showing won’t depend on how much rain falls until then, those directly involved with the project said Friday. It will depend, they said, on how many volunteers turn out Saturday, particularly Saturday evening, and Sunday. 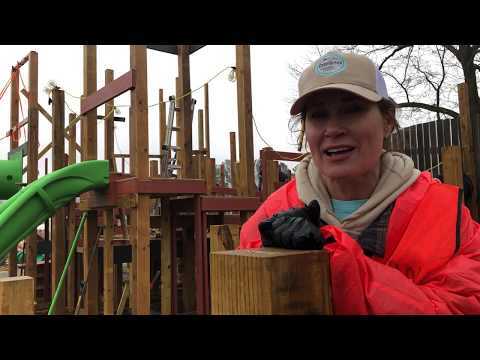 The rebuild of the community playground, first built in 1990 but demolished late last year to make way for the new version, began Tuesday with fair but cold weather through Thursday, until somewhat warmer temperatures and rain came Friday. Rain is in the forecast for Saturday and possibly Sunday. Some of those volunteers included Superintendent Jeff Moorhouse, Assistant Superintendent of Administration Andy True, Communications Editor Marybeth McLain and other school system employees, as well as firefighters, parents and other community members. The goal for each day has been about 60 volunteers, but the number Thursday evening swelled from 70 to 80. “It’s starting to look like one (a playground),” Edwards said. Angie Everett, volunteer coordinator and mother of a Johnson fifth-grader, and Nikki Church, who has three children at Johnson, said a call for extra volunteers Thursday night was heeded. “Last night was phenomenal,” Everett said while she and Church took a short break Friday afternoon from using an impact drill to attach composite boards to an elevated area. She said volunteers are especially needed Saturday night and Sunday morning. Skilled and unskilled volunteers must be 18, although those who help with the food can be as young as 14. “When you’re out here working, you’re not cold,” Everett said. For those who don’t want to miss church Sunday but still want to help, she said the volunteers have organized a small devotional service Sunday morning. And informal public viewing of the project is set for 5 p.m. Sunday, but the formal ribbon cutting is set for 10:30 a.m. on March 22. The project, paid for by Parent Teacher Organization fundraising, is using a combination of composite decking and regular pressure-treated lumber in other places to replace the all-wood structure that outlived its projected 25-year life span by more than three years. The surface will be a combination of a “poured-in-place” rubber-like surface and wood fiber.